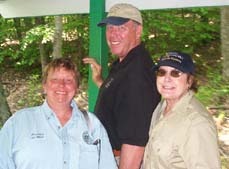 We had a few visitors in 2005. Dear Anne had the worst and the best of it. She came to help us move in October. We were living on camping gear, had plans to simply work at moving but the truck arrived five days late. 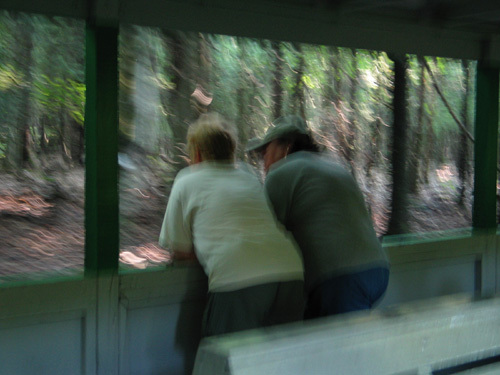 So Anne helped us put away, neat up and supervise the influx of Virginia relatives who in the nick of time, fixed up our run-in shed and the tool shed in time for winter. Later, Sharon and Elizabeth arrived for a few days. Elizabeth is one of those folks who can't sit still, so she spent some considerable time helping me can this and that and also did some temporary repairs on our tumbledown mansion. 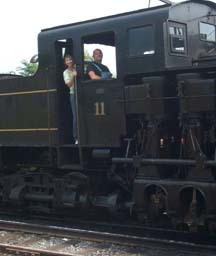 During that summer we accompanied guests a few times to the Cass Railroad. We aren't tired of it yet. It is always beautiful. 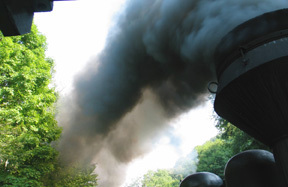 And who could not love a rootin' tootin' smokin'train. Don't you love the irony of the sign on the train. Jeff and Alice also came to stay a few days. AND, guess what? 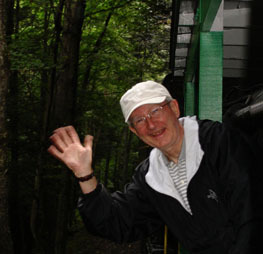 We took the train. Jeff replaced some fence that had come down and Alice helped Cyla can Zebra Tomato Marmalade and soup. 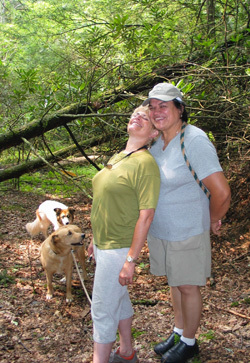 Sharon and Elizabeth walked our path with Tippy and Roger. Bill and Ginny visited and guess what? 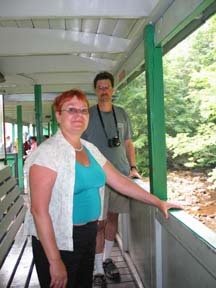 We took the train. 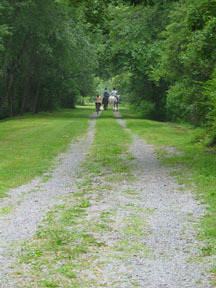 They also brought their horses and rode the Greenbrier River Trail with us. 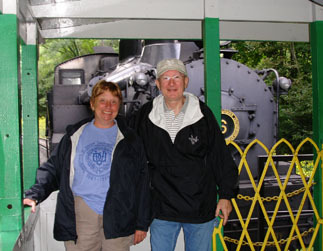 There is a lot more to do here in WV than ride the Cass Railroad, but so far we have not tired of it. Carl, Cyla's brother, and Debbie his wife were here, and guess what? 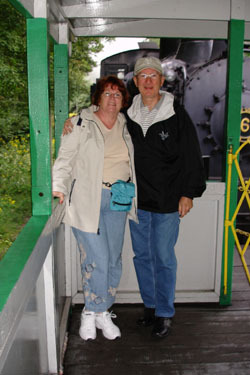 Joyce (November 16, 1949 - March 15, 2007) and her husband Russ (September 25, 1964 - September 6, 2006 ) visited that summer. 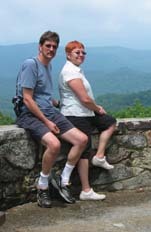 We will miss them both and are glad they where able to visit and enjoy themselves here one last time. We missed the train by minutes once but simply reversed the order and did our tourist shopping first and got another train later that day. We had a great time. 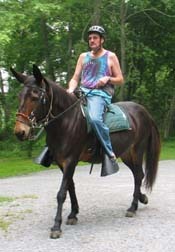 On another day, Russ got to ride Cyla's mule, Fester, on the Greenbrier River Trail. That was Russ's first time on a mule and Fester was a decent mule, to a point. Then he got his own mind going. The ride was fun but a mule can tell when there is a beginner aboard. 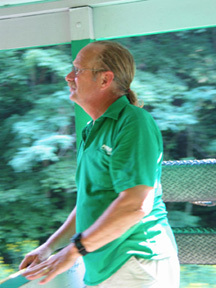 Of course, Fester does take care of beginners and does not let anyone get hurt while riding him. It is just that Fester has conversations about which way and how far to go. 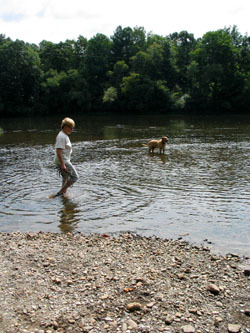 There much more to see and do here in here in West Virginia. How about a road trip from Wannabe Farm to Monticello, Virginia, with overlooks like this. We would like to thank our good friend Monna for riding her bike and keeping us safe and sound. She sort of rode shotgun for us. 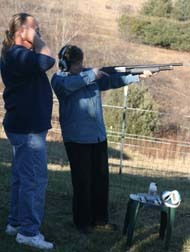 Speaking of shotguns, Sharon visited again with her friend Celeste. 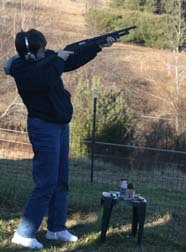 Sharon brought a new shotgun with her and wanted to learn to shoot it. She turned out to be a natural at hitting flying targets. Turns out she really doesn't need my help. Sharon's friend Celeste got into the game also. 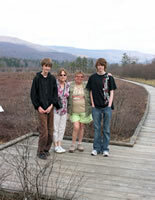 In April Barbara and Cled Jones and their two grandsons, Mathew and David came for all too short a visit. 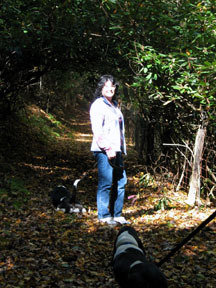 We did Beartown, Cranberry Glades, the River, shooting, throwing pots and general WV relaxin'. Cled particularly liked our afternoon break time, Barbara and especially Matt turned a good pot while David turned out to be a deadeye with the pistol. They say we were the highlight of their American trip. I can't quite believe that we stood up to the competition from NYC and Hollywood, but they all want to come back. Carol and Hank were here for a full glorious week. We picked them up at the Greenbrier Valley Airport and whisked them off to a mountian party with friends, food and music. And an outhouse amenity. Good sports the whole week, they went hiking with our mountain buddies, had venison soup, visited metropolitan Marlinton and its museum and feed store as well as dined at French's Rest. And more. Click on the thumbnail photos to enlarge.